The air around Ballynoe House usually blows in directly from the sea. As a result, there are few particulates to pollute the view of the night sky. This is a real bonus for amateur astronomers and casual stargazers alike. 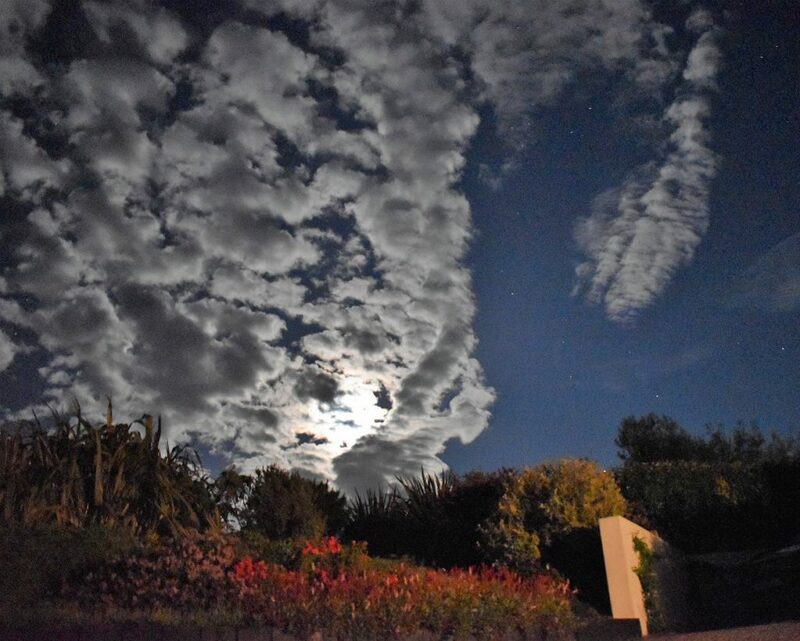 Situated in Dunowen, and therefore shielded from the “bright lights” of the town of Clonakilty by the Ardfield Mountain, Ballynoe House experiences spectacular night skies. Light pollution is minimised by the lack of street lighting. Helpfully, neighbours generally don’t leave their external lights on. Most visitors will probably not have experienced as black a night as a moonless West Cork night. It is an opportunity to see the Milky Way as you have never seen it before. In the event of particular celestial events during your stay, it may be possible to borrow the Ballynoe House 10” telescope (available to experienced astronomical telescope users only). 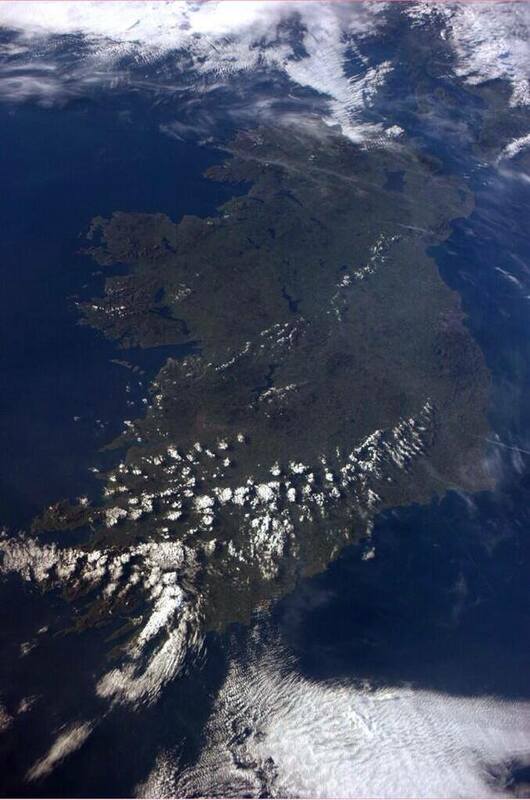 Ireland is noted for its dark sky policies. Serious amateur and professional stargazers will be interested to know that in 2014, The International Dark-Sky Association (IDA) announced that it had named the first International Dark Sky Place in Ireland. Kerry International Dark Sky Reserve, in the neighbouring county, was the first of its kind in the northern hemisphere awarded “Gold-tier” status. It joins an elite group. The Reserve sits on the Iveragh Peninsula, located between the Kerry Mountains and the Atlantic Ocean, ensuring some natural protection against light pollution. At time of writing, this Reserve had been measured to be to be in the top three darkest observation points on the planet. If you have your own telescope or binoculars, don’t forget to bring them. Binoculars are suitable to see Jupiter and it’s four main moons. The International Space Stations (ISS) frequently passes directly overhead of Ballynoe House travelling from west to east (see red arrow on orbital map). 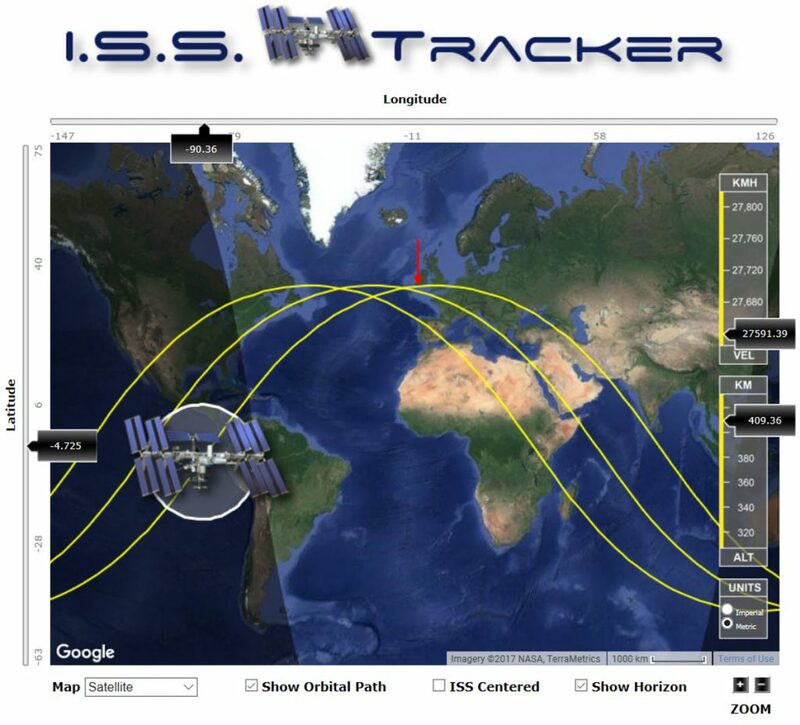 A online website tracker is available, so you can be ready to view as it passes. It moves very quickly across the sky (about 30 seconds). The best time to catch the ISS is close to or just after sunset, so the solar panels really stand out. On clear days, even if the air temperature is not particularly hot, visitors to West Cork will notice that unpolluted skies lead to a strong sun. It is recommended that sensible protection and sun block is used, especially for children.